The NFL season kicks off this week and millions of rabid fans are not only excited to watch their favorite team start the journey towards the coveted Vince Lombardi trophy; but many of them will be keeping a watchful eye on their fantasy football rosters in the annual pursuit of a fantasy football league championship. Each year, millions of people play fantasy football. These obsessive players spend hours pouring over stats, projections, and injury reports in hopes to put together the best possible combination of football players that can give them the highest number of fantasy points each week. These sports geeks will tweak their rosters and make adjustments based on injuries, bye weeks, and their next opponent. During the season, these fantasy team owners get together, watch games, talk smack, and burn up their league web forums and emails with gloats and excuses for what might have been. For many, fantasy football is an escape, a hobby, a social event; but in the end they all do it just for the fun of it. In a way, fantasy sports players are no different than gamers. Both groups have an obsession and passion for what they do, and even the game of fantasy sports mimics game genres common to many table top games, specifically role playing games and miniature war games. Let me show you how. Role Playing Games (RPGs) are all about creating a character you care about and building that character over the course of many play sessions. In the same way, fantasy sport team owners create teams for football, baseball, basketball, hockey and other sports that they will build over a season and sometimes multiple years. Owners give their team a name and a logo that will be identified with that owner over the course of the season. Many owners use the same name across multiple leagues helping to develop their persona that is used over the course of many years. For example, I have a fantasy baseball team that has used the name Crotch Scratchers since the mid-90′s. Over the course of those many years, I’ve won six championships and now the Crotch Scratchers have built a solid competitive reputation. Every RPG has a game master that is responsible for running the game, keeping the players on track, and making sure they provide an experience that keep players coming back to their games. Likewise, every fantasy sports league has a commissioner who is responsible for setting up the league rules, scheduling drafts, making sure the game runs smoothly during the season, and keeping owners happy so they will want to return the next season. In a RPG, if the game master is inflexible, stubborn or a control freak, there is a good chance people might not be interested in sitting in on another game with them. Likewise, if a commissioner is overly controlling, inflexible, does not take feedback from the owners, and runs a league with an iron fist, then owners will gladly look for another league to participate in. In the end, the real draw of RPGs for gamers is the social aspect. Friends getting together, sitting around the table for hours with their books and character sheets, laughing, eating junk food and just enjoying each others company. For fantasy sports players, the biggest day of the season is draft day. All the owners get together in one place, sit around a table for hours with their laptops, magazine and stat pages, laughing at other people’s picks, and eating junk food. Owners really enjoy this special gathering at the beginning of the season where all the league members get together in one place with the common goal of building a team to dominate the league. When it comes to actual game play, fantasy sports is a lot like miniature war games. In miniature games, such as Warmachine and Warhammer 40k, a player has many options to choose from when building their army. They will spend hours reading faction books, codexes, gaming sites, and forums in order to find the units that makes the most sense in the army they are trying build. Likewise, fantasy sports players spend hours reading fantasy magazines, sports sites, and forums in order to find the best players to make their team the most competitive it can be. In miniature games, there is always varied opinions regarding which factions and units are the best. Likewise, all the sports “experts” have varying opinions on which players will perform the best. But in both cases, the gamer and team owner must make a reasonable decision based on all the data they have collected. In miniature games, as you play games with other people, you start to tweak your armies. You remove units in favor of others or change units based on your opponent. In fantasy sports, as games are played and the season progresses, owners drop, add, or trade players in order to make the team even more competitive. In both situations, it’s an ongoing process of constantly reevaluating and adjusting the lineup in order to get the best results. Periodically, a gaming company will release new units for miniature games. When this happens, players scour the internet looking for information on the units, their stats, and then develop strategies on how to take advantage of those new units, or crush them. Likewise, every year new players join the league and fantasy sports owners scour the internet looking for information on the players, their stats, and then develop strategies on how to take advantage of those new players, both their strengths and their weaknesses. It’s on going process of research and evaluation even when you aren’t playing the game. There is one major difference between miniature war games and fantasy sports. When you play a miniatures game, your opponent directly affects how you play and the decisions you make. In head-to-head fantasy sports leagues, your team doesn’t physically play against the other team nor do the players on a the fantasy team really affect each other. It’s strictly comes down to the cumulative stats that are collected during the games. So with fantasy sports, while the actual games are played, owners just sit back and watch to see if they made the right decisions. While for miniature games, the most important decisions are actually made while playing the game. A subtle but huge difference. Personally, I consider myself a gaming geek and a sports geek. I’m obsessive about all things gaming and have been since a very young age. Likewise, I’ve played and watched sports all my life and am very passionate about my favorite teams. In both, fantasy sports and tabletop gaming, it’s all about the fun and the social aspect that I love. That’s what keeps bringing me back to the game table and draft room. I have many gaming friends that care nothing about fantasy sport leagues and I have many sports friends that care nothing about RPGs or miniatures. Just don’t realize how alike they are. Geeks are geeks. I thought it might be interesting if I wrote down some thoughts about musing about mine and Tony McRee's trip to Origins. I'll do my best to keep this from being too wordy. We arrived Wednesday afternoon and checked into the Hampton Inn. Very nice hotel and right across the street from the convention center. We went into the convention center and got our badges without any issues. No lines and the volunteers were very friendly. That night we had our first event, an RPG. We play a scenario using the Dark Heresy rule system. Now I'm a fan of the 40k universe and I know a little about it due to various games and books that my son reads. I also like somewhat 'crunchy' RPG systems and this has a good feel to it. The guys we played with were pretty good and so was the GM. We used pre-made characters and I got stuck with one I really didn't enjoy nor could get into to gameplay. Tony, didn't know much about this universe nor was crazy about the system so I think I enjoyed it more than him. The next day we checked out the exhibit hall. While a nice size it's a fraction of what's a GenCon which is good and bad. Bad in that there is less to see, good in that it isn't as overwhelming nor as crowded. We could demo and talk to any vendor with ease. We signed up for a World of Warcraft TCG beginners tournament and ended up being the only two. So we ended up demoing a couple games with the Cryptozoic people instead. We played the Penny Arcade Deck Building Game (which we've played before) and Epic Spell Wars of the Battle Wizards: Duel at Mt. Skullfyre. The game play of Penny Arcade is fun but the theme is rather dull. We asked about their new WoW deck building game and they said it uses some of the same mechanics so I'm looking forward to checking that out. The other game was really unique in its game play and we really liked it. It moved quick and was fun. But it is not family friendly. Very course language in the rulebook and the they go for the shock factor on the cards in title and art. It's something that would be fun with a group of guys and I hope they use that mechanic in other games. We had our three hour painting class that afternoon. The focus of the class was to get your model ready for the table as quick as possible. It was somewhat of a speed painting type class. It's exactly what I was looking for and every useful. In the span of three hours we took one model from priming to finish. Knowing the techniques and doing it on my own, I could do it in way less time now. The instructor said he can usually finish one in 30 minutes. We went over color choices, basecoating, washing, highlighting and brush techniques. What I was so impressed with is that this guy's job is a commissioned miniatures painter and he's all about cheap and easy. Buy a decent red sable brush, use decent paint (Citadel, Reaper, P3, etc) and you're off. No fancy palettes needed, no expensive washes or additives. In fact we never watered down our paint. We took it straight out of the pot and used Reaper wash right out of the bottle for washing. For thinning paint he said use the good ole Future floor polish. Anything else is a waste of money. He said if you just want painted models to play the game, there's no need to spend so many hours painting for that. If you are painting for competition, well that's a different story. Next year he said he was going to do an intermediate class and I'll want to take it. He gave us his contact info, and we ran into him several time during the show and he was happy to answer our follow up questions. That night Tony and I discovered the CABs Board Room. CABs is a local gaming club that sponsors a very large hall for checking out and playing games. For $20, anytime during the show you can check out one of their 1200 games. That $20 also includes a free game that is determined randomly, but no game is less than $20. I ended up with Pantheon and Tony got Sylla. Also, several times during the day, if you have a game checked out, you get entered for a drawing for another game and from that Tony won Nitro Dice. The great thing about the board room is being able to try so many games and talk with other gamers about their likes and dislikes. I had as much fun socializing with the people in there as I did playing. In fact, Friday night we ran across a couple guys that wanted to play 7 Wonders and we ended up chatting and play other games (Eminent Domain) until 3am. It was a lot fun. On Friday, we had our Achievement Unlocked Warmachine/Tournament. There were 10/12 players and it was very laid back. It wasn't about winning or losing but about grabbing achievement points. I learned so much during those games. In fact, I played one guy who is mainly a Menite player and during our game, every move he told me how I should use my guys. This guy knew what he was talking about because he went on to win 3 tournaments that weekend. He was a genius. In the 35pt tourny he was finishing guys off in two rounds. There were no slouch players (ok, there was Tony and I). I did learn, I'll leave the big tournys to the big boys. The casual and achievement tournaments are more my speed. Saturday we went to a game design class led the guy who designed Britannia. It was pretty interesting but he did more to discourage designing games than really charge you up. He says it requires a lot of work and a lot luck. During the day we kept checking on the Warmachine tournaments. Tony and I made a couple friends and we enjoyed talking with them about the game. The highlight of all the demos I did was that afternoon. Saturday night, it was back to the board room. And we got a nice surprise at 9pm. They had tons of games left over from the giveaway so they went around the room giving out more games so Tony and I each got another. As a result of that room, I got two free games and Tony got three. Well worth the price. Sunday, we did a little shopping and we got on the road. I had loads of fun and plan on taking the whole family next year. Lords of Waterdeep is a new game from Wizards based on the harbor city of Waterdeep in the Dungeons & Dragons lore. At its core, it’s an Americanized version of popular European worker placement games such as Agricola and Stone Age. Players take of the roles of Lords and are trying hire adventures to complete quests and to expand the city by purchasing new buildings. The players have agents at their disposal they use to go into buildings and recruit adventures. The adventurers include rouges, fighters, wizards and clerics. Over the course of the game, the player accumulates Quest cards that require a certain number of adventurers to complete the quests. Upon completing the quests, the player receives awards such as gold, more adventurers or victory points. In addition, the players can use gold to purchase new buildings for Waterdeep that can provide additional adventure resources to the game. The game board is setup on the table with a deck of buildings, quests and intrigue cards. The top three buildings from the deck are placed on Builders Hall as available buildings to be purchased by the players. Four quest cards are placed on Cliffwatch Inn. The Inn is where players can assign agents to take on new quests. Each player then takes a playmat representing their color of agent. This playmat is used to hold adventures, gold, available agents, current and completed quests. Each player is dealt two quest and intrigue cards. Also, each player gets a random Lord card that is hidden from other players. This Lord card can give end game bonuses to the player for completing certain types of quests. The first player is then determined by the last person to travel outside of their current city. Quest Cards - These are the cards used by players to accumulate rewards to be used in the game such as additional gold and victory points. Each quest has a requirement of a certain number of adventures to complete the quest. For example, Spy On the House of Light requires 3 fighters, 2 rogues and 2 gold to complete the quest. Once those requirements are met, the player puts his adventures back into supply pile and the gold into the bank. As a result of completing the quest, the player is awarded 6 victory points and 6 gold. Intrigue Cards - These are the cards that can be used by players to cause twists in the game. To play an intrigue card, the player needs to assign an agent to Waterdeep Harbor on the game board. Upon doing so they can play an intrigue card from their hand. There are many variations of intrigue cards that can cause other players to lose adventurers or gold, help the player gain additional resources or even make another player do a mandatory quest before completing any of the quests they currently have. Building Cards - These are additional buildings that can be purchased and put into play. Once in play, any player can place an agent in that building and collect a resource. The player that owns that building then also gets a small reward for another agent being there. That reward is based on the building and could be an additional adventure, gold or victory points. Lieutenant - This is an additional agent that is awarded to a player for completing a special quest in the quest deck. Ambassador - This is an additional piece that is awarded to a player for completing a special quest in the quest deck. The Ambassador is used to block buildings from being used by other players. The first player places an agent in a building and collects whatever resource that building gives. It could be gold, adventures, new quest card, new intrigue card, the ability to play an intrigue card, buy a building or claim the first player marker so that player can go first next round. Once an agent is placed, the player has the option to complete a quest. The player to the left then performs the same actions. Play continues around the table multiple times until all agents have been placed. At the end of the round, any player that has agents in Waterdeep Harbor gets to move their agent to another location and collect its reward. All players then collect their agents and continue to the next round. There are eight rounds in a game and at the beginning of the fifth round, each player gets an additional agent to use the rest of the game. After eight rounds, players count their adventures and gold on the playmat and adds one additional victory point for each adventurer and one additional victory point for every two gold they have. That point total is added to the total number of victory points collected during the game for completing quests. In addition, each player reveals their Lord card showing which two types of quests give them special bonuses (Piety, Skullduggery, Commerce, Warfare, or Arcana). An additional 4 victory points is awarded for each type of quest completed. After all points are totaled, the player with the most victory points wins. Lords of Waterdeep is one of the best new games I’ve played in a long time. While worker placement games are nothing new, Wizards has taken a popular genre and put a fresh of coat DnD paint on it. While at its core, quests are the best way to accumulate victory points. But by playing intrigue cards and owning buildings, you can affect others resource collections which in turn can hinder their ability to collect victory points. There isn’t a lot of luck to the game except the quest cards that are revealed at Watchcliff Inn. Sometimes you’ll miss the opportunity to claim a high reward quest. But if that happens, you can hinder that person that claimed that quest by trying to starve them of adventurers or playing mandatory quests on them. Lords of Waterdeep is one of those games where your strategy may have to change as the game is played. So it’s be important to be able to adopt a new gameplan mid-game. The components in this game are top notch. All the buildings and tokens are made of heavy stock cardboard and the cards have a textured surface to them which gives them a high quality feel. In addition, Wizards has provided a well designed storage tray to hold all the pieces once the game is done. Gamer Geeks - This game was immediately liked by my gamer geek friends.There’s enough depth and strategy to keep a player interested. And due to the many intrigue, quest and building cards, there is a good replay value to it. Parent Geeks - After just one game played with the family, they all were anxious to try it again. My wife, the casual gamer, had no problem understanding the rules and developing a strategy over the course of the game and even won our first game. As such, this is good game for the casual gamer and a great introduction to the worker placement genre. Child Geeks - My three sons, ages 9, 12, and 15, had no problems grasping the rules and after one round the rulebook wasn’t referenced again. While my 9 year old understood the rules, he had a little trouble developing a decent strategy. I think that will develop over time. But child geeks below 8 may lose interest in the game over time. In addition, good reading comprehension is needed to understand the quests and intrigue cards. My biggest knock on the game is that once we got several rounds in the game, the theme of the game started to be lost. Over time we stopped calling the adventurers rogues, wizards, fighters and clerics and instead called them black, purple, orange and white cubes. We also started to gloss over the quest flavor text and just started looking at the quest requirements and rewards. But aside from that, I’m very pleased with this game. In the multiple games I’ve played, long after we finished we continued to talk about the game, the strategy, what to do in the future and when we were going to play again. For my family and gaming group, this game is going to have some staying power. Waterdeep, City of Splendors, is a city well worth visiting again and again. Forbidden Island (Gamewright) is good entry game for those players, especially younger players, to try out a cooperative game where it is the players against the game. The goal is for players to work together to recover four treasures and return to the helicopter pad before the islands sinks or a player does not have a return path to the helicopter pad. The game is either lost by all or won by all. This game was designed by the same designer from Pandemic. Forbidden Island is a simple game to learn and explain. You are given a profession at random at the start of the game. Each profession as a unique trait that will help the adventures achieve their goal of collecting the four treasures on the island and eventually leave. During your turn you perform three things: Take 3 actions, draw 2 treasure cards, and draw flood cards equal to the water level. Your actions can be to move about the island, shore up flooded lands before they sink, give a treasure card to a fellow player, or capture a treasure if you have four cards of that treasure and are on part of the island where the treasure icon resides. You then draw two cards from the treasure deck that will either be treasure cards, special action cards, or the Waters Rise cards. Once you have resolved any special effects from this draw, you then turn over the Forbidden Island cards and flip over the matching Island tile to show that it is flooded. If the tile is already flooded, it is removed from the game along with the matching Forbidden Island card. Play continues like this until the adventures gather up the four treasures, all then must make it to a special tile called Fool’s Landing and escape the island by playing a special action card called Helicopter Lift. Players will loose if the special treasure tiles sink (are removed from the game) and the treasure can’t be claimed, Fool’s Landing sinks, or a player cannot make it back to Fool’s Landing. This game is a great introductory game to the whole idea of a co-op based game where all the players win or they all loose. Young players will like the treasure gathering aspect and will teach them that in order to win, we all have to work together. This game will also help you gauge if your gaming group is receptive to games of greater challenge like Pandemic, Last Night on Earth, Shadows of Camelot, etc. Due to the quick setup and easy to follow rules, this is a very good casual game to play with neighbors and that gives it high marks from the wife. She likes the interaction it brings to the table unlike card games and those games that are more competitive. Like I have stated before, this game is a great for introducing kids to a game where you are not competing against one another. The game doesn’t punish for a simple mistake, so let them test the “waters” and see if they can figure out the best strategy as a group. Anyway, if the group doesn’t survive then reset and go again because set-up is a piece of cake. As a self-professed geek, my three sons may as well been born with dice in one hand and a controller in the other. From a very early age, they were playing all sorts of board games and video games. They are very comfortable with the gaming culture and all three still embrace it. It is a wonderful hobby that can stimulate imagination, build intellect, and develop social skills, However, I also wanted to make sure they were exposed to many other things besides gaming in order to help them be a more well-rounded individual. As parents, we thought it was important to give them opportunities to participate other activities that they might find enjoyable. The first was sports. I'm a sports nut who loves to play and watch sports. I played lots of sports as a youth and for the past 25 years I've play organized softball. As a result, I know first hand how participating on a sports team teaches individuals how to work within a team, it teaches the importance of respect for authority (ie. the coach), shows individuals how to handle winning and losing, and stresses the importance of practicing to become better at whatever a person wants to do. With all three boys, I gave them the choice of whatever they wanted to participate in from baseball, to football, to basketball, to karate. For me, it didn't matter I just wanted them to participate in some sort of organized sports activity. If they didn't like a certain sport, they tried another. They are now ages 15, 11 and 9 and all three still participate in some form of sports. In addition, we love to go to ball games and watch them as family. They are great memories that will stay with them forever. Obviously, another huge benefit of playing sports is physical activity. Geeks have a negative stereotype of being overweight individuals who just sit in front of a PC or gaming table all day. Sports helps instill the importance of physical fitness they they'll need to maintain through their entire lives. A second form of activity I have supported with my sons is learning how to play a musical instrument. I took piano at an early age and it is an activity I've used my entire life. I currently play in a band at my church and in a local rock band. The discipline it takes to learn how to play an instrument is invaluable to an individual. Even if a person never becomes proficient at playing, the work ethic established can last a life time. So when my oldest son came to me when he was 10 and said he wanted to learn how to play guitar, we supported him. We got him a cheap starter guitar and he started taking lessons. Five years later he's now a pretty good guitar player, plays in a jazz ensemble in high school and spends more hours in his room practicing than he does in front of the TV. My second oldest recently decided he wanted to learn how to play the bass. So this past Christmas he got him a starter bass and he started learning how to play. In addition, he is playing trumpet in the Middle School Band which is developing his music reading skills. Now, he may decide he really isn't into being a musician and that is fine with us. We just wanted to make sure he had the opportunity to try it out. Another activity we thought was important was community service. It's so easy nowadays to get caught up with 'self'. In a time where the entitlement culture can be a strong influence on a child, we believed that helping and putting others first could show the boys how good they got it. Serving others showed them how they could make a difference in peoples lives and, in return, receive that joyful feeling when helping those in need. Whether it is doing service through local charities, the church or the school, we've seen a lot of growth in maturity in all three boys. Now these are just three examples of non-gaming activities that we thought might be good for our family. But it could be anything like writing, painting, dance, art, theater, geo-caching, the list is limitless. Don't get me wrong, gaming is a fantastic hobby that we spend many hours doing and enjoying. But taking time to put down the dice and controller has helped cultivate an appreciation for many different things that our boys will enjoy for a lifetime. As a husband of one and father of three, finding time to game can be tough. My sons are at an age where they are active in school and sports, so the wife and I stay pretty busy making sure they are all where they need to be. In addition, we are active in our local church and I even play in a local band. So time is a premium (as I'm sure it is with most families). Thus, carving out time slots here and there to game is pretty tough. Some close gaming friends of mine are pretty good at making sure we get together once a month to play. I'm part of a gaming MeetUp group and they meet once a week. I try to go to one of their events each month. I'm fortunate that each person in our family games so we strive to have game nights at least once a week. But for us hard-core gamers, that's not a lot of gaming. Therefore, when I get to game, I'm very particular about what I play. I love to experience new games and typically get hyped about any major game release. But with so little time, I have to pick and choose what I do. In my early days of gaming it was easy, I only played the Lord of the Rings TCG. And I sunk a lot of time and money into that game. Then over time it seems I was trying a new CCG every time one was released. Of course, I needed people to play with so I persuaded my friends to try (which they soon started calling, "pimping"). Most of my friends were married and the kids were young so it was easier to find times to play. But as we all got older, we just couldn't constantly be switching games. So now we spend a lot of time talking about games we have interest in, what would have staying power, and what people would be committed to get into. Our latest long term excursion is Warmachine/Hordes. This is the first time I have gotten into a miniatures war game and the time and money commitments for this type of game is pretty substantial. Getting into the hobby takes a serious investment in order to buy all the painting and assembling supplies. Once you have that, then it takes a lot of time to assemble and paint figures. And this is all before I've rolled one die for a game. Once we started playing actual games, I see that it will take a lot of time just to learn the intricacies of the rules, strategy, etc just be able to be competitive. The good thing about this is that it's keeping me focused on one game...but it's not totally satisfying my gaming itch. I've always loved card games, but the investment is just too much now for a CCG. Thankfully, Fantasy Flight Games came out with the Living Card Game series that gives me the satisfaction of deck-building but without the collection component. So since it's release, I've been into the Lord of the Rings LCG . It doesn't take as much time to build a deck and play as it does to paint models and play minis. So it's my game for when I don't have a lot of time to sit and play. Right now, I'm trying to focus on only those two games. But there are so many other great games coming out. The board game market is exploding now with AAA titles and I want to try them all. But I have to curb those desires to rush out and buy on release day. Because of that, having a couple gaming groups to play with gives me the chance to try games without the upfront investment and it satisfies my desire to always trying the latest thing. So with very limited time, I'm doing a good job of trying to stay focused on only a couple games. But that Star Wars LCG is looking pretty good. And the Quarrior expansion comes out this summer so I really need to get that, And, you know, Iron Kingdoms RPG comes out later this year. I'm sure a new RPG won't take much time...sigh...I guess the first step to recovery is admitting you have a problem. I'm fortunate to have a core group of friends to make up a local gaming group (LGG). Over the years we have played many different games...CCGs, board games, miniatures, card games. But one type of game we've never played together was the classic pen and paper RPG. We had always talked about playing one, but there was never a consensus on the system we'd use, or who would want to dedicate their time to being a game master (GM). So, we never got around to doing one. 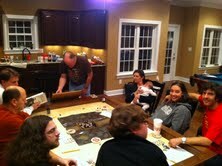 Now within my family we have done some very light RPGing. My sons bought the Dungeons and Dragons Red Box and we tried a couple scenarios of that. At Free RPG Day, we picked up Fantasy Flight Game's Deathwatch and we played a couple sessions of that. Then at GenCon last year we signed up to play the Hollow Earth RPG. So the family has dabbled in RPGs, some members of the LGG have dabbled in it...but never together as a group. Well, thanks to Facebook, last year I reconnected with an old friend from High School who is gamer and into RPGs. He writes his own scenarios and GMs games using the Savage World system. He was more than happy to run a one shot scenario with our group so that we all could finally experience an RPG together. So, this past weekend, the entire group came over ready to dive into a 4 hour scenario written by the GM. He brought pre-made starter characters so all we had to do was pick a character, get an overview of the game mechanics then start playing. The start was rather slow because we were learning as we go. But as time went on and we understand the game and our characters better, the pace picked and we really started enjoying ourselves. We had 8 players which is rather large for a RPG, but the GM did a great job of keeping the game moving and keeping us entertained. The group dynamic was rather odd though because some people were role-playing their characters while others were just playing the game. I was one of those 'just playing the game' because I was so focused on the mechanics and strategy that I didn't allow myself to get immersed in the game. It's kind of like a MMO such as World of Warcraft. There is a story there to be played if you take time to read the text that the quest givers give you. But after a while you just start reading what needs to be done (ie. Kill 10 orcs), skip the text, click OK and go. The immersion is gone and then it just becomes a hack-n-slash. Now that I understand the RPG genre a little better, the next time we play I'll embrace the character a little more. It will also help if we all 'roll' or create our character from scratch. That way you can create a character that is something you want to play and have more of a personal interest in.